After being washed out in our poor old tent we were lucky enough to move into one of the wooden pods. They are brilliant! This is a really lovely and quiet little site, excellent facilities and well stocked little shop. Can't thank the owners enough for looking after us. I have returned home recently having spent two weeks at Looe Country Park which I understand has recently changed hands. The help we received on arrival was first class the site was clean tidy and toilet block spotless staff were friendly which is more than can be said for the weather. I would recommend this site and should we visit the area in the future have no hesitation in staying again. Leuke kleine camping met grootte plaatsen. Vanuit deze camping is veel te doen, doordat het met de auto goed te doen is. Er zijn mooie stranden en kustpaden aanwezig in de buurt. (Translation)Nice place small site with large pitches. From this site has a lot to do, because it is doable by car. There are beautiful beaches and coastal paths available nearby. Fantastically clean and quiet. Perfect for a relaxing break. The people who ran the site (owners?) were very friendly and helpful. We will definitely be returning. 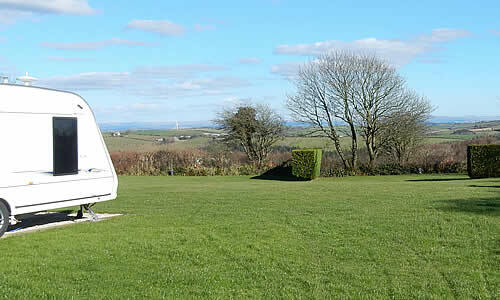 This park is one of the best we have pitched our caravan on and we would definitely visit again. Amanda and Dale are brilliant hosts and do everything they can to be helpful as well as keeping everything spotlessly clean We enjoyed the best nights sleep we have had in months here as it is so peaceful. Carry on the good work and many thanks. Just returned from a two week stay at Looe Country Park shower and toilet facilities were excellent and the park is very well maintained a gem of a site will return in the future. My husband and I paid our first visit to Looe Country Park this July. One word - Perfect! Excellent site, clean, organised, peaceful. The owners cannot do enough to help. Very informative regarding walks in the area. We walked miles with our dog. If we come to Looe again, will certainly book in at this park. Credit to the owners! First visit to Looe Country Park. Very Peaceful and well kept site – credit to the owners. Enjoyed visits to Eden Project and long walks on the coastal path. Easy access to Looe and Polperro. Good food at The Three Pilchards in Polperro and The Granary restaurant 10 minutes walk from the site. Yet again another pleasant stay at the superb Looe Country Park campsite.Would highly recommend this quiet,pleasant campsite to anyone looking for that extra something. Looe Country Park was a great place to stay. The holiday caravan was lovely and we also went night fishing in Looe quite a lot. The weather wasn’t too bad and the boys were playing cricket nearly all the time. We had a great time and really want to come again. Thanks! Just got back from Looe Country Park this was our first visit, had a brilliant holiday, the site is one of the best we have been on, facilities are excellent and very large pitches. loved the showers and a very quiet and well kept site. Brilliant site, 5* facilities, owners very friendly and helpful, just had a fabulous week camping, July 12th – 19th, great walks to looe,seaton and good position for visiting other places on the coast. Nice quiet site! First time at Looe Country Park and what a gem!! Excellent accommodation, very clean and very comfortable, our hosts made us feel very welcome and nothing was too much trouble, the weather has been fantastic for October and we made the most of it. This site is absolutely brilliant. Without doubt the best site we’ve ever been on. The caravan was superb, the facilities were the best. Many thanks Dale for the loan of the battery charger which got the car going again. What can we say – it just gets better and better. This is our third visit and we have already booked for next year. The van, site and all facilities are excellent and the welcome from Amanda and Dale is unsurpassed. See you next year! We stayed at Looe Country Park last week for our second visit in as many Years. This is a fantastic, well managed site with friendly and helpful owners. Top quality facilities in a peaceful setting. Thanks for a great holiday, hope to see you again soon. We come from Bournemouth and as nice as home is we really love Looe and have been coming here for 29 years. This is our fourth visit to Looe Country Park and we will be back in the Autumn. We love being here and love the caravan. So after a lovely week we hope to see you again soon.